I'm crazy when it comes to the last piece of candy. I want to make sure it lasts. The big trouble is that I have no ability to make all the other pieces last. 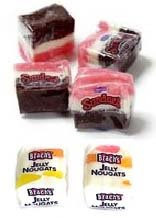 I bought a small bag of Brach's candy, the bulk kind at the grocery store, with two different flavors -- the Sundaes Neopolitan Coconut one and the Jelly Nougats. Both are quite good, even though they're probably not good for you. The first one I took out of the bag while driving home from the grocery store was one of the Jelly Nougats. And I believe, without examining it completely, since I was driving, that it was a rare albino one, meaning there were no jelly nougats to be seen from the outside. I was sad after popping it in my mouth and chewing it because I should have examined it, plus maybe take a picture of it. Later, I was thinking of the white animals born in foreign countries that indicate the birth of an avatar or dali lama. And I hate the thought that maybe I ate the evidence of some heavenly sign. But I did. You get quite a few of these to the pound. And when I have quite a few I'm not husbanding them as a candy stash like we did as kids, but my mind is drifting while looking at the computer or TV, and I'm gobbling them willy-nilly. I always have the resolution to take my time on the next one, since why hurry, it only means eating more than you need, plus the stash vanishes more quickly. Anyway, this one tastes the same as the next one, so why rush? But then the resolution never holds up -- chomp chomp, down the hatch -- and I have to move on to the next one. There's also the danger with a fresh one that it's going to pull out a filling, all the chomping you have to do to get it soft. Then the supply gets low and I'm thinking of something I read in one of Ram Dass's books, how the Buddhists say everything is suffering. An example Ram Dass gives is an ice cream cone, that even this is suffering because when you have a full ice cream cone you're already anticipating it being gone. That's from the book The Only Dance There Is. I truly am thinking of the candy being gone before I dig in, but it starts to hit me the closer we get to it being gone in fact. Then I get down to the last few pieces -- and these have to stretch, until I forget. Then the last piece in the bag. But I know that one fell out in the drawer here, so technically it will be the last piece. Then when I get to it, maybe some hours later, this is indeed the last piece of candy! This last piece has to stretch and stretch and be all salivaed up, dissolve and break up on its own. Until I start writing this blog article, forget, and swallow it.